Yesterday the heavens opened over the farm. It didn’t drizzle. It didn’t shower. It bucketed down. A combine of farmers gathered in the shed and we shouted at each other over the noise of the rain on the tin roof. Impromptu meetings of this nature have been a bit thin on the (dusty) ground lately, so our celebratory drinks tasted particularly sweet. When Bearhands and I first moved to the farm, I wasn’t well versed in the art of off-the-cuff catering. I’ve improved a little over the years, thanks, in part, to recipes like this one for homemade sausage rolls. I got caught out yesterday and didn’t have any left – so I’m rectifying that this afternoon. 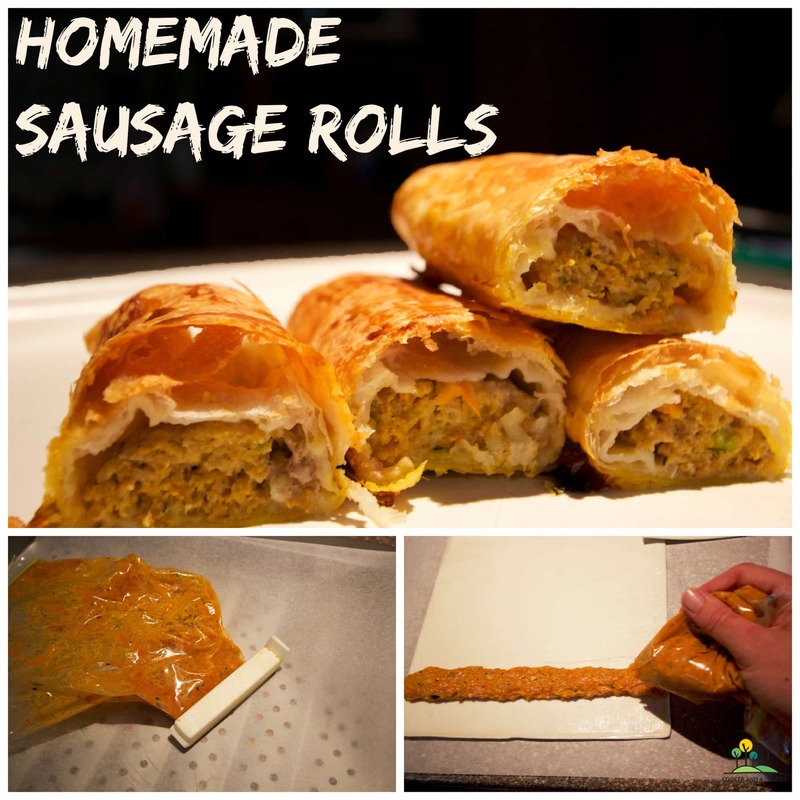 I make a double batch, wrap the uncut sausage rolls in individual lengths, and freeze them. From there they’re easily defrosted for spur-of-the-moment rain parties and easy kid dinners. Grate the parsnip, carrot, and zucchini. Finely dice the onion and crush the garlic. In a large bowl, combine the grated vegetables, onion and garlic, the sausage mince, egg, sauce, vinegar and seasonings. If you’re short on time (or enthusiasm), you can do these first steps very quickly in a food processor. Lay out the sheets of puff pastry. 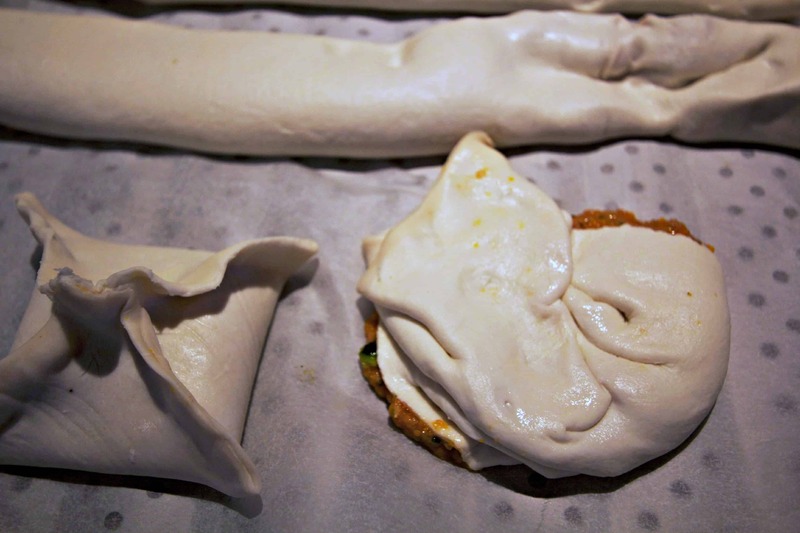 Fill a piping bag (or a ziplock bag – see tip below) and pipe the sausage mix onto the pastry in long lines. Carefully roll the pastry around the sausage mix – leaving enough pastry overlap for a good seal. Cut the pastry and repeat until all the sausage mixture is used. If you’re making extras – wrap them tightly in cling film and freeze immediately. Preheat your oven to 180ºC, brush the pastry with a little milk and bake the sausage rolls for 15 to 20 minutes until golden brown. Serve with tomato sauce and lashings of precipitation! I use a ziplock bag for piping the sausage mince – it’s much easier than trying to scrub sausage mince out of my piping bags and it avoids giving any future icing an onion taint. Load the mince into a ziplock bag, then cut a corner out of the bag. If you need to refill your bag at any point, you can seal it with a plastic bag clip until you’re ready to pipe again. You needn’t stick with sausage rolls either – my girls are partial to mince parcels (they call them teepees). These little parcels are easy to make, simply slice your puff pastry into four quarters, and add a large spoonful of mince mixture into the centre of each square. Then join the corners in the centre, and squeeze the pastry at the joins to seal the parcel. If you’re feeling patient, you can let the kids join in! what’s your go-to dish when unexpected guests arrive? It’s still raining Aleney and we couldn’t be happier about it! May I also say, Flossie looks so lovely – you must be very proud of yourself! I was going to run with a whinge of farmers, but thought better of it! I just found your site from the ProBlogger forums. I’ve been making similar sausage rolls for a while know. I sometimes make them for dinner with mashed potatoes and vegetables. But the best part is, the kids love them for lunch the next day (or 2). I just take them out of the fridge, wrap 2 in foil and throw in the lunch box. It makes for an easy school day morning! Thanks for visiting. I hadn’t thought about packing them as school lunches – great idea! (I’ll admit I’m pretty happy to be taking a break from school lunches for a few weeks now! ).